There are more than 40 reasons. In fact, there are at least ten to the 82nd power, which, I am told, is the number of atoms in the universe. And that's just in ordinary matter, which makes up only 4.9% of the universe, the rest being dark matter and dark energy. 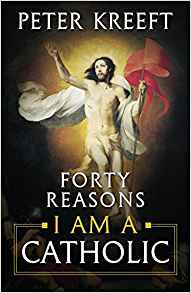 Each of my reasons is an independent point, so I have not organized this book by a succession of chapters or headings. After all, most readers only remember a few big ideas or separate points after reading a book. (I've never heard anyone say "Oh, that was a good continuous-process-of-logically-ordered-argumentation" but I've often heard people say, "Oh, that was a good point." Which takes me back to my main point: "Why are you a Catholic" is a good question. A good question deserves a good answer. Here are forty of mine.